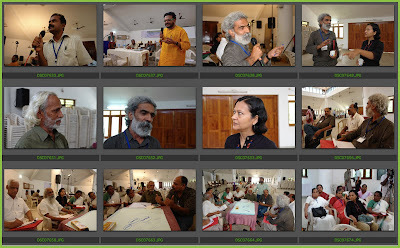 Brief summary of the proceedings of the Kerala State Institute of Design (KSID) Vision meeting at Kovalam on 9th and 10th November 2009. Followed by recommendations and action points. 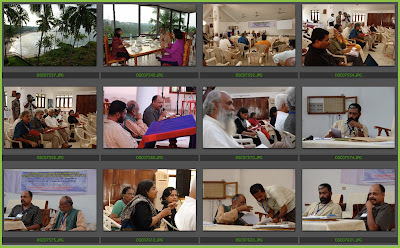 The conference that was held at the Kristu Jayanti Jubilee Memorial Animation Centre at Kovalam and the conference were set in motion by the Executive Director of KSID, Shri P T Girish who welcomed the delegates and experts to the Vision of KSID conference and invited Prof. Prabhat Patnaik, Vice Chairman, Kerala State Planning Board to deliver the presidential Address and Shri P K Gurudasan, Hon’ble Minister for Labour and Excise, State Government of Kerala to Inaugurate the event. Shri P T Girish made a presentation on the KSID and Shri Jogi Panghal was requested to deliver the Vote of Thanks. Prof Prabhat Patnaik in his Presidential Address called for an action programme to bring innovation to Kerala and India. He commented that innovation was conspicuous by its absence and this needed to change fast. However he recalled that traditional crafts have demonstrated this capability over centuries but feudal and patriarchal attitudes run deep in Kerala and there was scope for a Central University to bring change. Here KSID is a powerful and ambitious idea that would need to bring design expertise and invoke creative change in the society at large in Kerala. Shri P K Gurudasan, Hon’ble Minister for Labour and Excise, State Government of Kerala inaugurated the conference by lighting a lamp and invited the delegates and participants to join him to light the lamp. Shri P K Gurudasan called for a focus on the crafts of Kerala as a point of departure. The need to address matters of quality raw material and products alike and to address the impact of globalization and competition with strategies for marketing and articulation of modern trends were items at the top of the agenda. He stated that the role of KSID would be to coordinate design action in many sectors and to provide supports through new design initiatives as well as promotion and publications. New initiatives to train and educate the crafts sector functionaries asa starting point. He recalled his visit to NID and his meeting there with NID Director Shri Pradyumna Vyas as well as NID Faculty members form a number of disciplines including Prof M P Ranjan and Prof Aditi Ranjan and stated that this visit had helped change the concept of KSID and which brings our focuss to the concept of the Vision conference that is being held here in Kovalam. He mentioned that the Director of KSID was a product of NID and this would help in shaping the Institute as we go forward. He stressed on the need for building an appropriate institutional infrastructure quickly so that the next level of funding could be mobilized in the near future. He welcomed and thanked all the experts and participants for giving their time for attending the Vision conference at Kovalam. Shri Jogi Panghal delivered the Vote of tthanks. Shri P T Girish delivered the Directors address (Directors presentation Appendix 3) and outlined the concept of the KSID and listed the action taken so far towards setting up the institute in Kerala. He shared a picture of the renovated building that was being used to house the institute and outlined the events such as registration of the society under the Travancore and Cochin Literary Scientific Societies Act of 1955, followed by the setting up of the Governing Body, Expert Committees and Academic Committee that could develop the action plans for the institute and steer it in the right direction. Shri P T Girish informed the meeting that 4 acres of land had been acquired for the institute and a call for architects had been launched formally. He called on the meeting to articulate a clear brief for the architects for the design of the building and mentioned that four architect s had sent in their expression of interest to take up the task. He reported that there were efforts to make the institute live and active through the conduct of training programmes for artisans and through new product development and that two students from the IICD Jaipur were already on the list of sponsored candidates involved on project based activities of the institute. He mentioned that KISD facilities and infrastructure still needed to be developed but in the meantime a number of activities will be rolled out..
Shri Ashoke Chatterjee kicked of the session by recalling the talk with other experts the night before the conference which had established that the KSID would be a work in progress for quite some time ahead. A clear structure and mission would have to wait till Kerala’s real needs are assessed and articulated by the activities of the Institute. He asked for clarity about the role of KSID and expressed the ned for a discussion as to whether the KSID would be an institute for the crafts development or an institute for design education and action. He suggested that Keralas needs may extend to include the travel and hospitality sectors which has been a major user of design services for over 40 years now in India as well as in Kerala. He recalled his visit to Kerala 40 years ago to help set up the first beach resort at Kovalam. He cautioned about the need for deep deliberations to get the objectives right and in particular about the need for a good brief for the architect of the new campus and its facilities. In the discussions that followed Shri Jogi Panghal agreed that a good brief was a critical need but he also said that we would need to be sensitive to the needs and aspirations of the community in Kerala and what they would want from a new institution. He proposed that the instutute should adopt policies that are open, inclusive and transparent for all its activities and programmes. Prof M P Ranjan stressed that the architect must be told that the building must have a great degree of flexibility and like the NID building it too should be open to change as and when required. Prof. S Balaram, who spoke next called for design education that could foster thinking that was different. Freedom and autonomy with a physical space that is conducive for design work are a critical resource that should be created. He stressed that heart of design lay in innovation and called for a balance between skill instruction and thinking, both lateral and analytical thinking would need to be used. The ambit of design could extend from procduct, messages, spaces and services all the way to experiences as well. He quoted the example of Vishala in Ahmedabad that focused on the experience of a meal in a rural setting and stated that Kerala too may find applications for such a kind of thinking in the travel and hospitality sector that is a major business in the State. He spelt out threee priority areas for KSID in the days ahead. 1. Survey and documentation of the resources of Kerala to build a strengths map thaty could indicate the areas of priority for the KSID. 2. Focus on getting the right kind of students at the KSID since many of Kerala’s students tend to go outside the State for their education needs today. Awareness building would need to be done since local awareness of design wsa still very low in Kerala. 3. Getting good teachers is always a great challenge. This needs to be addressed both with policy as well as with some strategies that are practical. Prof M P Ranjan asked for clarity on how he proposed to address the third issue. Prof Balaram replied that the awareness building would need to address both parents as well as the students directly. In the search for good design teaching talent the KSID may start by having a larger proportion of their teachers as visiting faculty with a long term commitment. While this is difficult it is practical and can be sustained and the other schools are all experimenting with this format quite successfully. Prof Sangita Shroff warned that the KSID must look for a complement of full time faculty as well to handle the variety of tasks that a growing institute would need to handle in order to build a good work culture and a healthy academic and administrative balance. Full time faculty are needed to maintain a level of intellectual and emotional balance on the campus with multi-level activities of education, administration and development projects. Prof Balaram agreed with a need for a balance. Shri Jogi Pangaal stressed that good design teachers were hard to get if not impossible for a new institute. He therefore stressed that the policy of using visiting faculty on liberal terms may need to be adopted. He proposed a new kind of architecture for the involvement of visiting faculty as a continuing contact person for the students with an implied use of web as a channel for maintaining this contact. Dr Deepak John Matthew used a case study of a photography activity and expanded on the type of planning and development that would be needed to make the KSID work and deliver the tasks and objectives that are being set out today. He expanded on the NID model and listed all the stages of planning and curriculum development that would be needed as well as the range of equipment and the activities and projects that may be needed to build a department with excellence. He stressed on the need for photography both as a tool for documentation as well as a service department for the rest of the institute and that this would need to be set up at an early date and be maintained at a high level of quality. He suggested that the curriculum could include theory, skill and project based courses. He proposed the need for interdisciplinary classes as well as a Foundation programme for new entrants. He suggested faculty exchange programmes as a way for maintaining faculty quality and contact with new ideas and developments. For students he proposed that by waiving fees or offering stipends that KSID would attract students who would otherwise not be able to afford a good education in spite of having great talent. Shri Vinod Krishnan asked if Deepak was asking for a clone of NID to be set up in Kerala or would the emphasis be on design for the tourism sector. Prof Ajay Kumar stated that creating capacity in the State for photography could be one of the objectives of KSID. Prof Yunus Khimani, recalled the history of the IICD that was set up in Jaipur by the Government of Rajasthan with the assistance of NID. The mission of the IICD was to create design techno managers who could create a bridge between designers and markets as well as focus on design, market development and technology development for the crafts sector as a whole. He spoke about the structure of IICD and the processes that it had adopted to improve and develop its education programmes in UG and PG levels with the setting up of an expert Academic Council and a local Board of Studies that could work in cooperation with the faculty of the school. The hallmark of the school was hands on training and the making of prototypes for all new design projects which provides the students with a good feel of the material, technique as well as market possibilities through field contact for gathering insights that inform the design work. Field exposure is particularly stressed and in 3 years of education the student is expected to spend almost one year in the field at a number of occasions. Drawing is another ability that is stressed in the education process at the IICD. Ms Sumita Ghose who spoke next commented that the KSID had an advantage of being in the Labour Ministry and therefore had the possibility of looking at the task ahead in a bottom up manner rather than a top down manner of policy to the field. She recalled her experience of setting up an NGO for the development of people in Rajasthan and how they came to crafts as a means for generating livlihood with the introcduction of embroidery and other textile crafts that the people already had a capacity for in their present setting. As a trained economist she realized the need for good organization in the crafts sector and in managing the lives and needs of rural people. She stressed that good organization was needed in the crafts sector and the need to shift the policy initiatives form charity orientation to empowerment approaches which could be the focus of the KSID. Design development work alone was not enough since this tended to end up in a number of prototypes but this needs to be translated into a business flow for the benefits to reach the people for whom it is intended. She explained that Rangsutra had started with a call for design and marketing with good organization in a cooperative format. This gave the base for a producer company with a Head+ Heart for survival of the craftspeople. KSID too may need to look at producer groups and stalkeholders with a balanced social and economic agenda. Perhaps the research could look at organization design for empowered craftspersons in the days ahead. Prof Ajay Kumar summarized the morning session and a good deal of discussion followed. He said that there was no traditional craft left in Kerala due to costs and market pressures. People have moved on to more lucrative occupations. Kerala is fast changing from traditions and many NGO organizations were active in the field but we may need to research as to how well these NGO’s have changed the condition of the craftsmen. He stressed that the KSID should be a design school and not just be focused on crafts alone. This is truly what Kerala needs today. Shri K B Jinan intervened and stressed that Kerala artisans too had their needs. Prof Sangita Shroff opined that the KSID should first undertake the task of understanding Kerala today. She stressed that the use of image in the task of developing a shared understanding of Kerala was important. Getting images from the field and placing these in contextual structures can reveal many latent needs and design opportunities that could be addressed by the KSID in the days ahead. She called for a documentation of Kerala with a “soul”, a process that could tell us a lot about the condition of the State and its needs and aspirations. This could be done with film makers and photographers being coordinated to build a map of Kerala resources and needs, a “Map with Pictures”. This could be linked with Social Enterprises and groups of professionals who could think strategy and seed entrepreneurship in the State. Shri Jogi Panghal suggested that KSID could interact with artisans in new ways and bring Kerala into its domain. Prof. Sudhakar Reddy suggested that the emphasis could also be on the making of new craftsmen entrepreneurs if traditional ones do not exist. Prakash Murthy felt that the need was to instill pride in the craftsmen for their skills and traditions through some appropriate strategies. Prof Ajay Kumar recalled that in our national history the Schools of Art abandoned crafts to upgrade their own fields of study. Ms Sumita Ghose reminded that in India as in Kerala the areas of agriculture and crafts are the two biggest providers of employment in the country. Shri Ashoke Chatterjee opined that there was a lot of confusion in the development sectors and in some Government policy statements the crafts sector was being described as the sunset sectors!! He ebven suggesxted that some economists suggest that 80 % of India is moving to urban centres but this would be a real disaster. Shri Jogi Panghal suggested that we must take a fresh look at crafts in Kerala and at the new wage levels as a challenge and an opportunity for imaginative design action. The daily wah=ge in Bastar is Rs 45/= per day while a Kerala craftsman would expect upwards of Rs 300 to Rs 500 per day for a similar level of work. Development has wiped out crafts in some areas while it has retained them in places due to poverty levels and a desperate need to work. Prof M P Ranjan made a visual presentation to support his arguments that were stated in his written paper (paper and visual presentation Appendix 5). He used models to explain some salient aspects of design and design thinking. He explained why the true value of design was difficult to perceive and appreciate since much of the offering was invisible or intangible.. He proposed that value perceptions and the appreciation of intangible design offerings was not possible to appreciate unless these are explained in detail or are articulated by the design team as part of their presentation and claim. He used twenty case studies to show how design can be used at many levels of action all the way from material and form, through structure and performance and upto meaning and culture. These stages he characterized as the First, Second and Third Orders of Design that have been elaborated in earlier papers and presentations. He called for the use of design in Kerala as a vehicle for development and strategy across many sectors of the economy and the role of KSID would be to make the process of bringing design into everyday use effective and wide spread particularly in areas of public good. He showed models developed by his students with the use of images and metaphors in his class called Design Concepts and Concerns where they had developed a variety of institutes that could meet the needs of India’s varied geographic regions through the use of design and design thinking. He suggested that KSID too should adopt these methods and develop shared perspectives with stakeholders and then go about implementing these in the institutional frameworks that would be both effective as well as relevant. He proposed that KSID start by building an inventory of design needs of Kerala and set about addressing these through education, awareness building and extension activities. KSID could help by bringing books on design to Kerala through translating some selected ones into Malayalam so that the ideas could b made available at the grassroots level in the State. Prof. Sudhakar Reddy spoke philosophically about the role of crafts in the evolution of the human race. He spoke of traditional knowledge being a base for peace and harmony and that the act of making with our hands is a fundamental human need that would include the handicrafts as well as the fine arts, both which are rooted in our senses as well as in a whole range of attributes determined by function, aesthetics, surface explorations, utility and sensitivity to our surroundings etc. Making, is a basic instinct and it is this making that also makes us human. Thus articles are intended for humanizing society by making these accessible to all those who may need it for a variety of purposes. Traditional articles have a deep structure and meaning, just as colour is used with a specific purpose so is form and other attributes. Gandhiji used non-violence as a method. The control of natural resources was undertaken as a search for power. Peace can be seen as an economic and stable condition but it can also be seen as attitudes of individuals in search of meaning. Peace could be a goal and the making of paper can be a fine activity that could be recommended as well. With roots in traditions we could see it as an activity that is modern and being carried out in the pursuit of sustainable action in the face of present day global challenges. We can bring about an awareness of value transmission through the use of design. This would require high motivation. However, he expressed doubt if this could indeed be achieved and he ended with a wonderful quote about water. KSID vision could focus on research, education, collaboration, practice and advocacy. Prof Sangita Shroff, spoke briefly about the areas of focus that KSID could look at in the initial years of its establishment. She commented on the opening remarks by Prof Prabhat Pathak and stated that the KSID should move from the rooted feudal structures towards a secular school for design and action on Kerala. She listed the various statistics about Kerala and drew the attention to the special qualities that needed to be kept in focus. It was a small state with high level of educational achievement and a stable population. The wellness industry, the entertainment industry and the sports achievements all suggest that Kerala could build products to enhance the achievements that it already has in these sectors. She also proposed that students could be offered an earn while you learn scheme to encourage entry from the disadvantaged sections of the society. However the whole premise would be based on the first task of mapping Kerala and its resources in a visual format that can be shared to build the action programmes that would follow. Shri K B Jinnan, decried the sterile form of education that was being offered by main stream design schools that was based on the Bauhaus model of design foundation. He claimed that this affected the natural aesthetic sensibilities of the regional student and gave them homogenized aesthetic that was neither suitable nor appropriate for local action and local cultural development. He proposed that the KSID should be primarily be seen as a crafts development school and not as a generic design school for Kerala. Shri Jayagopal, showed his architecture projects to the conference at the invitation of the Director, KSID. He has carried out a number of works in the tradition of the great architect and his guru, the late Shri Laurie Baker. He showed examples of many projects done using crafts and local traditional building systems and he presentation was followed by a brief discussion. Shri Prakash Murthy offered a checklist of actions that the KSID could take forward on an urgent basis. He stressed that the pride of the craftsmen was an issue that had to be addressed since many development initiatives have eroded that pride and it needs to be re-instilled in the social fabric of Kerala so that the youth would take up fresh initiatives in the crafts sector with design as a driver. Prof. Vinod Krishnan raised the issue once again as to whether the KSID should focus on Crafts or on Design as its primary activity. He suggested that the Kerala Planning Board may need to take a call on this matter and issue a clarification so that the further planning could move forward in a determined manner. He proposed that the KSID could be partnered with a leading institute of repute that could help incubate its activities in the early stages of development. He stressed that there is a need for need assessment in Kerala and he endorsed the views expressed earlier for a need survey in Kerala today. He reiterated that KSID could start with a mapping of the various design opportunities that exist and based on this concretize a plan for a design school in Kerala. Shri Ashoke Chatterjee commented from the Chair that that design could be carried out with crafts in focus and that incubation was a good idea. He called for a vision with an action plan and he called attention to the break between the building and architecture trade and the crafts and called for a renewal of these links through a planned programme of action by the KSID. Shri T M Cyriac made a visual presentation of the hotel buildings that he had designed for a local developer. He said that the hospitality industry needed good quality furniture and services that were not currently available in Kerala or for that matter in India today. He showed the work that he had outsourced from producers in Bali, Indonesia and these covered stone, glass, wood and metal components and systems that had been executed to specifications produced in his office as well as based on drawings by local artists and master craftsmen. He explained that Bali had perfected the art of giving design and production services at a reasonable cost and at good quality using a very reliable supply etnic that made his work easy. He said that Bail offered a number of ready solutions that could be customized for local appiications with ease. He specifically commented that it was easy to get a new design prototyped and fabricated through the Bali producers. This is the impact of globalization. In the discussions that followed many issues of globalization and cultural expression were discussed. Shri Jogi Panghal mentioned that Shri Singhal in Jaipur offered similar services to international architects using the Rajasthan crafts skills and contacts. Shri Ashoke Chatterjee added that he had seen a traditional expression done in the Carribean that was sourced from Bali. The discussion touched upon globalization, business excellence, competition and the role of crafts in the future and how KSID could take a cue for all that was happening around us today. Prof Sangita Shroff mentioned that crafts sensibilities need to be introduced from the school level itself and offered the example of the Krishmnamurthy Foundation schools that took this training and exposure very seriously for their students. Those who get such and exposure go on in life to many different occupations but they are all sensitive to art and culture and this majkes a huge difference to their professional lives and brings quality to all their activities. Shri Ashoke Chatterjee suggested that the infrastructure of the ITI’s could be a source for new opportunities for such high quality business training of artisans. He proposed the use of tools to reduce drudgery and offered a few examples of their successful use in some major projects involving stone, stained glass and other materials. Prof Sudhakar Reddy suggested that functional and utility crafts could be an area of focus. Shri Ashoke Chatterjee warned that excessive dependence on exports may harm the crafts due to rapid change in their demand structure and suggested that local markets as an alternative that could be developed. 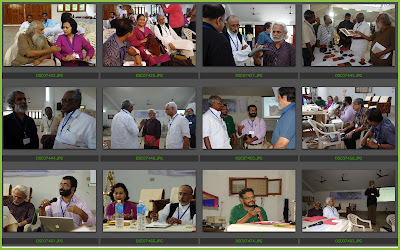 Prof Vinod Krishnan came forward and gave a summary of the proceedings in Malayalam for the benefit of the participants from the local NGO sector. Shri Ashoke Chatterjee summarized the comments and proposals from the preceding three sessions in a list of 32 specific suggestions and comments and he called for these points to be taken forward in the group workshop sessions that would follow after the groups reassembled. The groups were divided into two teams, one to look at the Administrative and Infrastructure issues that had to be addressed and the other group would look at Programmes and Activities that the KSID could take up with the immediate funds available with it and at its disposal. He listed a number of action points that had come up in all the discussions that had taken place so far. 1. KSID needs a full time Registrar to assist the Director. 2. KSID needs full time Programme officers to manage and handle startup projects as well as field work type projects. 3. KSID Director needs a full time Office assistant. 4. KSID needs a full time Librarian to be able to start the acquisition of book resources in a sustained manner. 5. A one page brief to be developed by the working group to be given to the KSID architects and a procedure that could be implemented urgently. 6. Location of the budgets needed and the development of suitable heads and subheads that could be assigned to specific tasks on a priority basis. 7. Delegation of powers for the use of these budgets by the Director and by other functionaries based on and approved action plan. 8. Documentation of all programmes carried out by the KSID so far needs to be done and these should be packaged so that they can have an impact with users and the State Government and other stakeholders who need to know. 9.Need for marketing expertise at KSID was felt and the Entrepreneurship Development Institute could help in this matter. 10. Mapping Kerala with the use of rich visual mapping techniques is an urgent need. 11. Photography skills could be rapidly developed and shared through the medium of short courses and workshops that are aimed at specific groups. 12. New opportunities could be explored with obvious partners such as the ITI’s, the Weavers Service Centres and look at the needs of sunrise sectors such as the Wellness Industry and the Hospitality sector, Health sector and Sports sector with a focus on National thrust areas. 13. A detailed Action Plan for the immediate period and an extended plan for the first two years. 14. Vision and Mission explained: Vision is a picture of tomorrow : Mission is the roadmap of how to reach that goal. 15. KSID has not shown any real progress since May 2009 meeting and that is not acceptable. State Government need to do more. 16. Commenting on Prof Prabhat Patnaik’s opening address he suggested that KSID should discuss the empowerment of people and the feudal make up of the Kerala. From this base develop a clear brief for the programmes and activities of the KSID. 17. Crafts could be a starting point for KSID activities. 18. Called for a clear articulation of “what does Kerala want?” and “What does Kerala need?’ based on the call made by Prof M P Ranjan in his approach paper. 19. Recalled that Shri Jogi Pangal had raised the same questions and had suggested field surveys as a way to answer some of these. 20. Asks for recommendations for the specific crafts that could be taken forward by KSID. 21. Asks for an active contribution from the KSID Board for directions forward from this event. 22. Stressed to get activities started even if the building and campus may take some more time. 23. Need top explore the suggestions of having an MOU with NID and IICD at an early stage. 24. Explore the relationship between designers and craftspersons and build strong linkages in the discussions ahead. 25. Need to develop mutual respect between designers and craftsmen. 26. Quality – What is it? The need for clear benchmarks for KSID to follow. 27. Bibliographies of all crafts documentations done by NID, IICD and NIFT could be collected by the KSID as a starting point for their own research initiatives. 28. List of key books for KSID own resource centre may be developed and the suggested ones immediately were tha Handmade in India, Bamboo & Cane Crafts, Stone Crafts of India etc. 29. Invite KSID and Crafts Council of India to conduct an economic survey of the Kerala crafts sector. 30. Recalled suggestion by Shri Jogi Panghal that vision and mission of KSID must be value based and called for the development of a list of values that could guide the further proceedings. 31. The question of wheteher KSID will be a Design School may be deferred for the future discussion while direct action plans are drawn up today. 32. Sugggested the formation of two breakout groups that could discuss these issues in depth and prepare recommendations for the KSID management to take up later. In the discussions that followed Shri Jogi Panghal stressed that the visual mapping project may be taken up as a priority area. Prof M P Ranjan called for a multi disciplinary approach and said that besides designers the use of anthropologists and ethnographers may also be considered but work must be in a design mode of finding new opportunities rather than just collecting facts. Prof M P Ranjan stressed the need for spreading design knowledge specifically in Kerala by the use of the local language in both schools as well as at the college levels as an activity for the KSID to take up that would bring it visibility for its intellectual contributions and a better understanding of the complex subject that is much needed in India today. Kerala and KSID could take leadership by producing some popular design books that explain the subject in the local language as a co-branded product or an KSID imprint in cooperation with the publishers as well ast the authors of the selected works. He specifically recommended two books listed below for consideration. 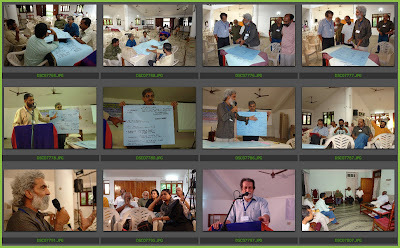 Working groups assembled in two parts of the conference room and over two sessions worked our=t a checklist of recommendations that were captured on chart paper diagrams and these were presented to the plenary session in the presence of Prof Prabhat Patnaik. Base on these discussions the following recommendations emerged. Prof Pratap Patnaik summed up the conference presentations and complimented the delegates for the huge effort that had been put in over the two days at Kovalam. He agreed that the Infrastructure plans and activity plans for the KSID would need to be informed by flexibility in thinking and both the space and faculty planning had scope for innovation. He agreed that flexibility was important for a design institute and that all design institutes must be open to new ideas. He agreed that the KSID had started out as an Institute for design and the crafts sector could well be one of its major areas of focus in the early years. The intentions of the KSID have been articulated in the MOA based on which it was registered but the Government of Kerala had an open mind and the experts could shape the institute as we moved forward. However he suggested that we should not loose sight of design as a driver for the activities at the KSID. He opined that KSID may face many hurdles and being in the Government sector may bring in its own constraints but this he felt should not burden the KSID and sometimes the struggle is within ourselves in articulating clearly where we would like to go from here. Frozen structures can only damage the long term viability of any entity and many great institutes tend to loose their vitality after sometime. He urged that the KSID would work in ways to keep this vitality alive for a long time to come and this needs vision and a clarity of mission. He recalled that in the West there are many institutes of excellence that have kept amazing us repeatedly over long periods of time, some over 100 or more years. History of its establishment may have set up some constraints for the KSID but while finance may take some time to respond he did not feel that there were any major constraints that would impede the development of an institute such as the KSID. He felt that there was a need to continue the dialogue with experts as had been done over the past two days and while the Geography in Kerala may be a bit of a constraint with limits set by the hills and the seas the mind need not be limited by these geographic limitations. He suggested that both the Governing Body and an Executive Body or Council could be considered if found necessary for operational reasons and thanked the members for their contributions at the conference and workshop sessions at Kovalam over the past two days. 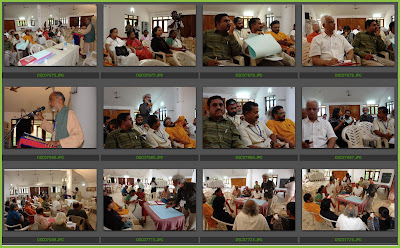 The above post was drafted based on my notes at the two day conference at Kovalam on 9th and 10th November 2009.